Pneumatic Conveying | Phenix Equipment Inc.
Flexicon’s PNEUMATI-CON dilute phase pneumatic conveying systems range from single-point “up-and-in” installations to cross-plant systems with multiple pick-ups and discharge points and automated controls, satisfying an exceptionally wide range of bulk conveying applications. All are custom-engineered and fully integrated with other Flexicon equipment and systems, and your new or existing process. PNEUMATI-CON dilute phase pneumatic conveying systems move bulk materials that are suspended in an air stream that is introduced by a positive pressure blower upstream of material intake points, or by a vacuum pump that removes air from the system downstream of material discharge points. The material is separated from the conveying air at the use point, then discharged on a batch basis via butterfly or slide gate valves, or continuously via rotary airlock valves. Since conveyor lines can be routed vertically and in any horizontal direction, over short or long distances, through small holes in walls or ceilings, Flexicon PNEUMATI-CON systems are easy to integrate into production environments in which process equipment and other obstacles often exist, while consuming minimal floor space. Powders having wide-ranging bulk densities, as well as flakes, pellets, capsules, tablets and other friable materials, can be handled by a single Flexicon pneumatic conveyor, providing the flexibility needed to transport multiple ingredients. 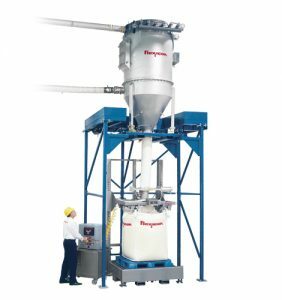 Powders having wide-ranging bulk densities, as well as flakes, pellets, capsules, tablets and other friable materials, can be handled by a single Flexicon pneumatic conveyor, providing the flexibility needed to transport multiple ingredients. Flexicon PNEUMATI-CON systems feature easy-to-maintain filter receivers with access doors and inspection ports, as well as rotary airlock valves with optional rotor support bars for easy access, cleaning, and inspection. PNEUMATI-CON conveying systems are available in carbon steel with durable industrial finishes, or stainless steel finished to standards required for industrial, food, dairy and pharmaceutical applications. Available upgrades include quick-access and quick-disconnect fitments. PNEUMATI-CON systems fully evacuate the vessel being discharged and the conveyor line itself, minimizing cross-contamination of multi-ingredient systems. Complete transfer of material also ensures that individual and consolidated batch ingredients reach their destinations accurately by weight, maximizing quality while minimizing waste. With a PNEUMATI-CON conveyor, capacity can range from several pounds to tens of tons per hour, feeding any destination from small packaging lines to silos and railcars. Moreover, excessive fluctuations in the feed rate — resulting in overloading or underloading — will not damage the system. Totally enclosed and dust-free, a PNEUMATI-CON conveying system prevents contamination of the product and plant environment, allowing safe transfer of contamination-sensitive materials including dusty and hazardous products. Self-contained Flexicon PNEUMATI-CON conveying systems complete with feed hopper and/or pick-up wand, blower unit, filter receiver, and control package, are available pre-engineered and configured on caster-mounted frames for in-plant mobility.